In the 90s the apartment complex, built in 1959, no longer satisfied the current comfort standards. A modernization was imperative. Both the apartment building and the two annexes (boiler room and store) were renovated and special attention was reserved for the improvement of energetic performance. The choice of an energy efficient renovation became increasingly self-evident because of the following reason: by simultaneously modernizing a second, identical apartment building and paying no special attention to its energetic performance, the pros and cons can be weighed up. 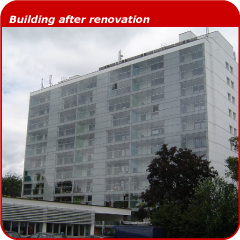 Moreover, after the renovation the building could serve as an example project for sustainable social housing. The existing structure was preserved, but the initial arrangement design and organization were completely abandoned: a number of ground floor apartments constitute the building base, above which the first floor contains storerooms and grants access to the apartments on the upper floors. The latter are considered to be through lounge apartments. On the outside the building was completely wrapped in insulation. Efforts were made to eliminate and/or prevent thermal bridges. Low-temperature radiators were installed in the apartments. In both the winter and summer period the winter gardens, located on the south side of the building, produce a buffer effect which reduces the heating demand and counteracts overheating. The preparation of sanitary hot water is realized in two ways: by two condensing gas boilers and by solar collectors. The photovoltaic cells produce energy which is used by the technical installations. A number of energy efficient measures were taken for lighting: the incidence of natural light is optimized by positioning the apartments in a way which allows the daylight to enter on two sides and thus reduces the need for artificial lighting. The common spaces are equipped with daylight detectors and time relay buttons. Water-saving taps and toilets were installed. A system for rainwater harvesting has not been realized, since the benefits would not counterbalance the corresponding costs. On the other hand, the hard surfaces were made waterproof and the preference of a renovation to a newly-built house involves a considerable saving of resources. The various measurement instruments and the central management system allow both the optimization of the installations and the screening of energetic performances. On certain points in time energy reports will be framed which identify significant measures and recorded problems. In doing so, the available techniques can be optimized.